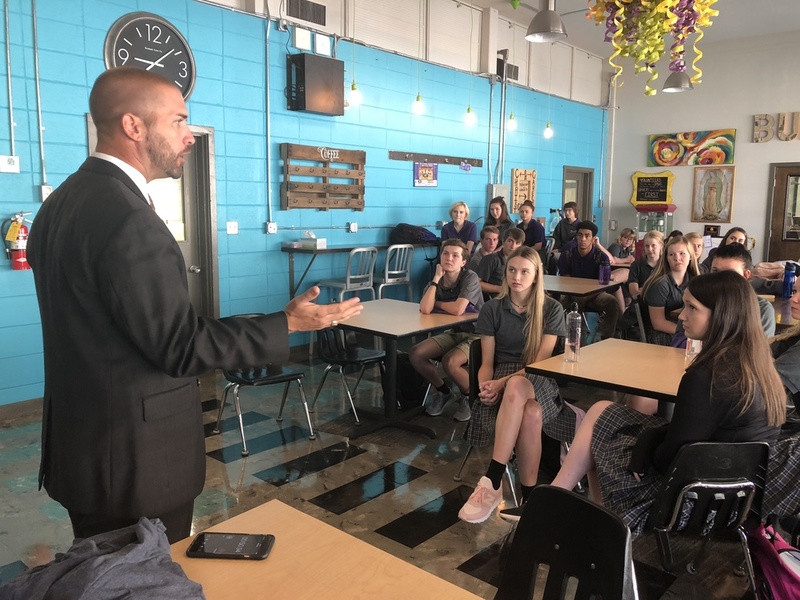 Faulkner County Juvenile Judge Troy B. Braswell, Jr. spoke to St. Joseph High School's seniors on September 18 in an effort to recruit some of them for the next Teen Court Class. Three St.Joseph students took part in the program last year which is designed to give participants the opportunity to help fellow teens who've violated state laws because of homelife situations. "I'm less concerned about what happened than why it happened," Judge Braswell said. "Many of these kids get into trouble because parents aren't there to guide them." The students selected to serve on Teen Court take on roles as prosecutors, defense attorneys, bailiffs, clerks, and jurors in actual cases involving juvenile offenders. By choosing to go this route instead an actual court proceeding, the accused are given second chances and are shown a better way than the destructive paths they were following.